The Gefen 4x4 Component/Audio CAT5 Matrix offers unprecedented flexibility and convenience by routing high definition video and analog/digital audio from any of four Component video sources to any of 4 remote displays over standard CAT5 cabling. Each remote display has a control box that allows the viewer to select any of the 4 video sources and control that source via an IR remote control as if the viewer was standing in the room where the source originates. Full High-Resolution HDTV signals are supported up to a resolution of 1080p at a maximum distance of 1000 feet. 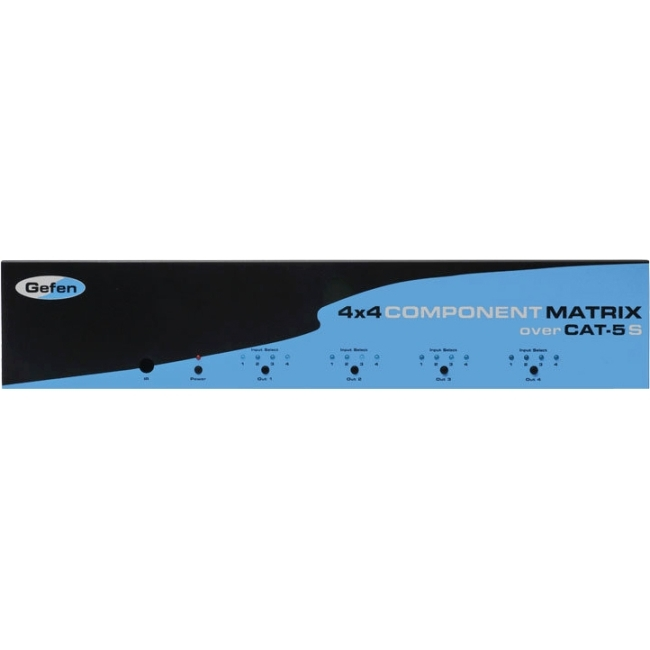 The Gefen 4x4 Component/Audio CAT5 Matrix works with any Component video source including DVD players, cable boxes, and satellite set-top boxes that connect to a Component display. Every source is accessible at all times by any display by selecting it with the IR remote.